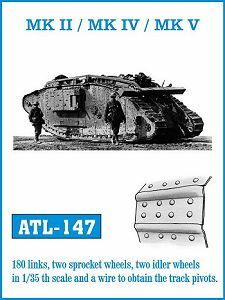 Fruilmodel have released these four sets of tracks and Grouser Spuds all being designed for the Emhar range of British WWI tanks, as the three track sets (ATL-146/147/148) are the same tracks just with different numbers of links for each set I'll look at these together as all comments apply equally to each set. 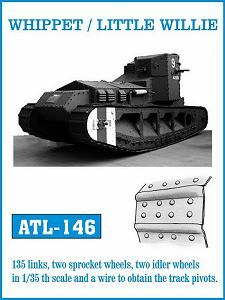 The Grouser Spuds Set #ATL-149 are then designed to be added to the metal tracks as required. 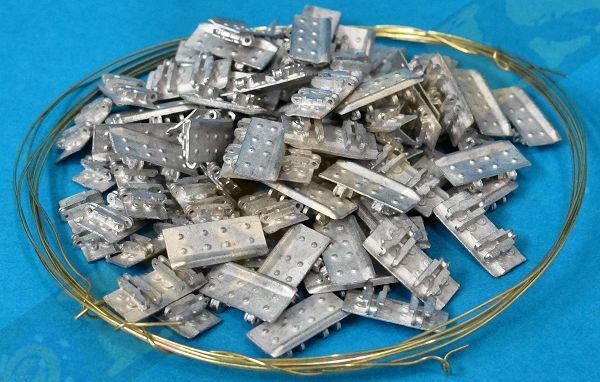 The sets consists of cast metal track links (set #ATL-146 135 links, #ATL-147 180 links and set #ATL-148 240 links) along with replacement drive sprockets and idler wheels plus the coil of 0.5mm brass wire for the track pins. Casting is good overall with just a few small burs to be trimmed from the ends of each link as well as from the drive sprockets and idlers which do have quite a few burs to file away from between the teeth and around the outer edges of the idlers. 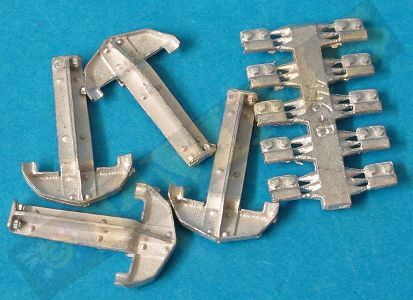 Each track link has pre-drilled pin holes and you do not need to drill these out as they are designed for you to force the short track pin into the holes which are then held firmly in place without the need for gluing. 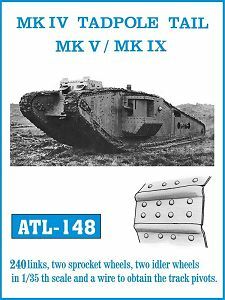 Included with each set is a full page diagram showing the alterations needed to the various Emhar kits to fit the correctly sized track links, but these are not the easiest to follow and some careful study of what is required will be needed. 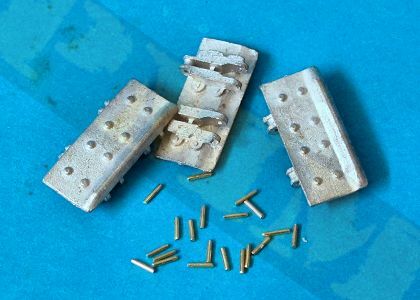 The Grouser set has 65 grousers with separate end connectors and there is a little clean-up needed from the ends of each grouser for the casting seam and some excess metal stubs, but these are easily removed ready for fitting to the assembled track runs. Each of the drive sprocket and idler wheel discs have three spacer pins and these will need the be straightened as all there bent to some degree in my sets but this is quite easy to do and once all the pins have been set perfectly vertical and the excess metal burs removed the two halves can be joined. The central boss of one disc is designed to fit into the other with the pins mating to the inside of the other disc and the fit was very good with the two discs sort of clipping together and holding in place with out the need for glue, but gluing would be advisable so they don't go anywhere. Assembly of the links is very straightforward from here in the usual manner for assembling Friul tracks although the wire is cut into short 2.5mm lengths and not the usual full width pins, this adds a little to the assembly as you have two pins for each link, but nothing excessive. You simply fit one link into the next and insert the two pins for each link using a pair of stout needle point tweezers, the pins are then pushed into the holes using the head if the tweezers and the fit is tight enough to hold in place without the need for gluing, you could add a small dab of cyanoacrylate to each pin end if you wish but I found this wasn't required on the length of track I assembled for the review. 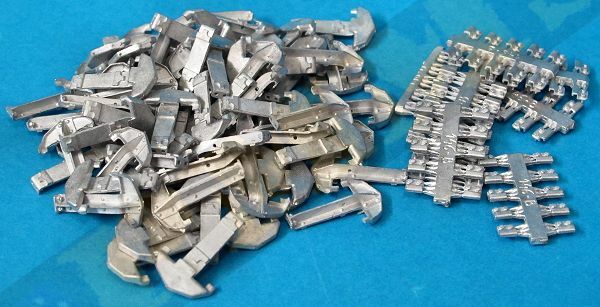 The track links before cleanup (left) and after cleanup with the wire cut to 2.5mm lengths ready for assembly. Link assembly, simply fit the links together and insert the pins either side to firmly hold the links together. repeat the process for each link until the required number is assembled for the tracks runs. The assembled track have excellent detail and articulate very freely. 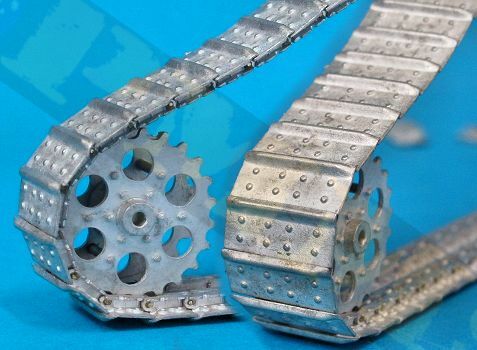 The assembled track runs articulate very freely and fit perfectly around the drive sprockets and idlers as you would imaging although a little pressure is needed to sit the tracks snugly around the drive sprockets the fit is good in the end with the sprockets designed to replace the kit sprockets. 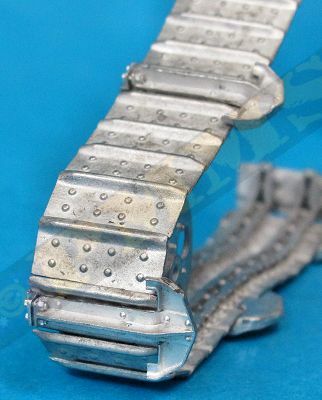 I do not have any of the Emhar kits to test the fit to the kits or test any of the alterations shown in the instructions but the assembled tracks have excellent detail on the outer face and inside of the links for a very good appearance. 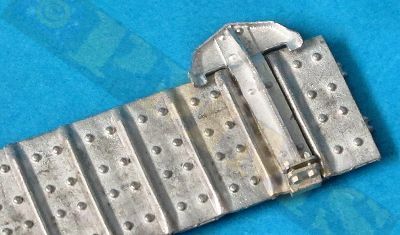 Each of the 65 grousers are nicely cast with crisp details although there is a casting seam and some metal burs to be removed from the large ends before assembly with the separate end clips cast 10 to a small casting runner and after cutting the clips free the burs need to be lightly filed smooth which is easily done. Fitting the grousers to the assembled track is very straightforward, you just slip the grouser over the outer edge of the track link and then fit the end clip over the other edge of the track link with the two small pins on the end clip fitting into the holes in the grouser arm help in place with a small dab of cyanoacrylate where the grouser arm mates with the link face and on the end clip. Each grouser is usually added to every sixth track link but this could vary as some photos show. 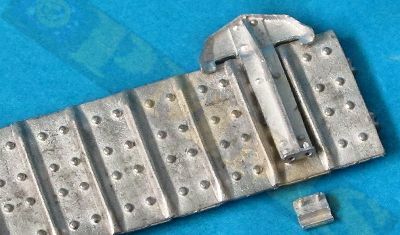 The grousers simply clip over the track link and is held in place with the end clip. The assembled tracks with the grousers added to evey sixth link. Tracks with grousers fitted to the metal idlers wheels. 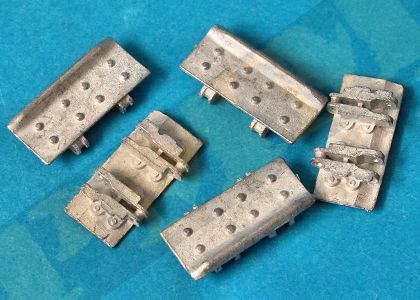 These are nicely detailed and cast replacement tracks designed for the Emhar kits with minimal clean-up and very easy assembly for the tracks that give a very good appearance once assembled. 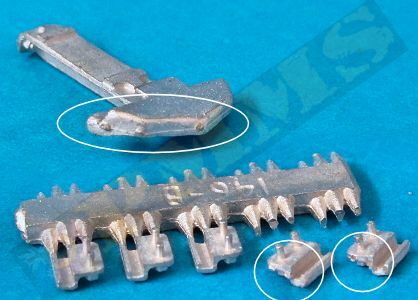 the replacement drive sprockets and idlers also have excellent details but there is some work need to fit these to the target Emhar kits as shown in the instruction sheet included. 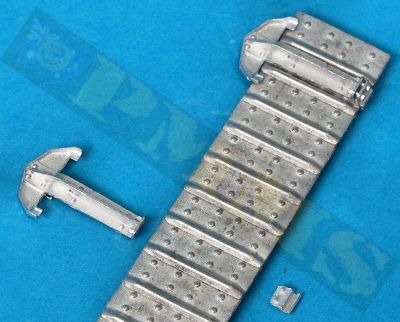 The separate grouser spud set adds another option for the tracks and these also having well defined details with easy fitting to the assembled metal tracks. 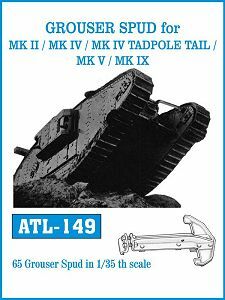 Now we have new generation Mk.IV kits announced from two manufacturers it remains to be seen if these tracks can be used with the new kits, for those who prefer metal tracks these are certainly ready made for the new kits but time will tell once the new kits are available? Thanks to Friulmodel for the review Sets.